Around these parts, The Newman Arms used to be called ‘that pie pub’. I worked 10 minutes away from it for 6 years, and I went a few times – mainly in the depths of winter, to hunker down in the tiny little room upstairs with sticky tartan carpets and too-close-together tables. It smelled like cabbage and butter, and the only thing on the menu was – yep – pies. Most of them were the kind of pies that pie purists get their knickers in a right old twist about; you know the ones, they harp on endlessly about pies needing sides, and these! These! They shout, brandishing their pitchforks. These are CASSEROLES WITH LIDS! Snore. Those days are gone now, and so are their pies. The upstairs has been refurbished; nothing extensive, just pared back simplicity. The dining room is tiny, and the kitchen even more so which makes it all the more impressive for what comes out of it. It's still a pub downstairs, and on a Friday night you may have to jostle through a street-full, then a pub-full of drinkers to make your way up the rickety stairs. The Cornwall Project has taken the space over; they're also in residence at The Adam and Eve in Homerton, The Three Crowns in Stoke Newington, and The Duke of Edinburgh in Brixton. They like their pubs. The Project started five years ago with Matt Chatfield, a Cornishman who has worked closely with suppliers in Cornwall to bring London restaurants the finest produce, and has now branched out on his own. From a short and changing menu, duck hearts with beetroot, blackberries and cobnuts is a great little starter; vivid on the plate, and the tender hearts sweetened with the fruit. 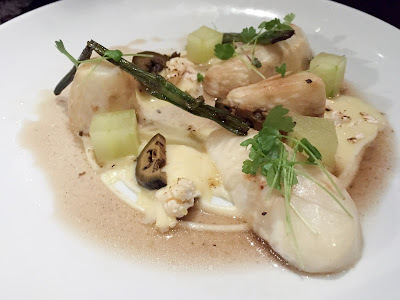 It felt wonderfully autumnal, and the softer, squidgier textures were offset by the roasted, crunchy cobnuts. Some fine bread, loose-crumbed and sourdoughy, came with a generous pat of butter. 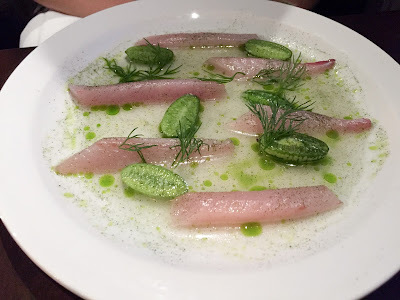 Mackerel with cucamelons - cucamelons! How cute are they? - and dill oil could have done with a heavier hand on the pickle flavour but otherwise the fish itself, served raw, was as fresh could be. Mackerel is an oily fish which has a tendency to go very fishy if it's been sitting around for a while, but there was absolutely no sign of that here. I am in love with cucamelons; grape-sized, cucumber flavoured and with a hint of citrus. 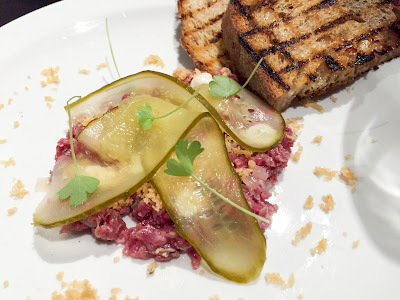 I loved the aged rump cap beef tartare, properly beefy and chopped coarsely, so you could feel each little piece in your mouth. My poor companion, an avoider of the raw flesh, found that she really liked this one in small doses. Me? I piled that chargrilled toast up high, relishing the pickle and the smoked anchovy cream that dotted the tartare. 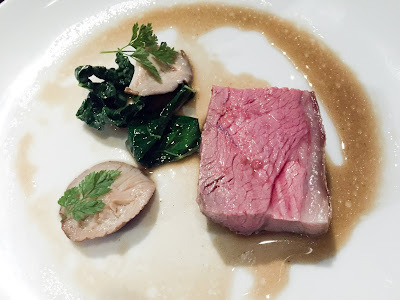 An unexpected treat from the kitchen came in the form of lamb rump with an incredibly, impossibly crisp skin. God I love salty salty lamb fat. Pickled shiitake mushrooms made a change from the usual, a more interesting accompaniment to what can sometimes be a fairly standard meat-and-two-veg choice. The turbot though. Now this was pretty damn special. Pearly white flesh, on top of crushed potatoes, grilled yellow courgettes and purple micro-basil. Don't ask me what the sauce was - I have no idea and the menu missed this bit off - but my word this was good. 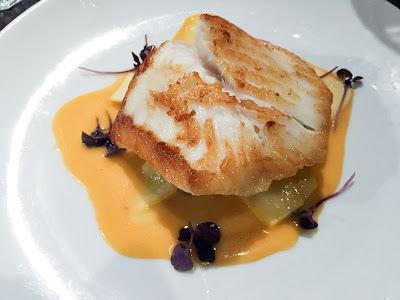 Even though I know turbot is one of the most expensive fishes out there, at £25, it's the most expensive dish on the menu so it had a lot to live up to. Thankfully it did, and I was loathe to share it. It's very well I did, because otherwise I may have been denied the salt-baked celeriac with Tunworth cheese. It says a lot about a restaurant when out of 4 main courses you still fancy trying the vegetarian option (ok, maybe it says a lot about me), choosing over pork belly and beef shortrib. I have fond memories of salt-baked celeriac from The Ledbury; the salt-baking really intensifies the flavours, condenses the textures. Tunworth cheese is a runny, pungent one, adding some extra oompf. Pickled walnuts were a nice touch, and I especially liked the cubes of crisp, sharp apple; completely unexpected and it sounded bonkers on paper, but worked beautifully on the plate. I didn't take a picture of dessert. I completely forgot. I was having such a lovely time that once the dessert was set before us, we went at it and that was that. It happens a lot with me and desserts. The chocolate mousse was not, in fact, a mousse but was actually a baked fondant, those things with a liquid centre that Masterchef contestants seem to decide to make all the time despite its propensity to go completely wrong. This did not. The insides were molten, the outsides were cakey. It was light enough, topped with ice cream, for us to wipe the dish clean, and not so rich as to make us feel sick. As you can tell, I am a big fan of The Newman Arms in its new incarnation. We had a couple of dishes gifted to us (the beef tartare and the lamb) because Matt is just a bloody nice bloke but without it I can hand on heart say that I would feel the same way. 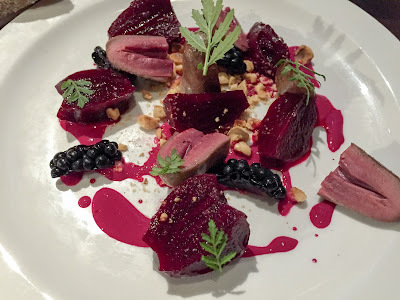 These days finding a restaurant in the environs of Soho and Fitzrovia that is actually bookable, with brilliant food that won't bankrupt you is a rare find, and The Newman Arms is all three. Love the photos too. I'm yet to try The Ledbury!